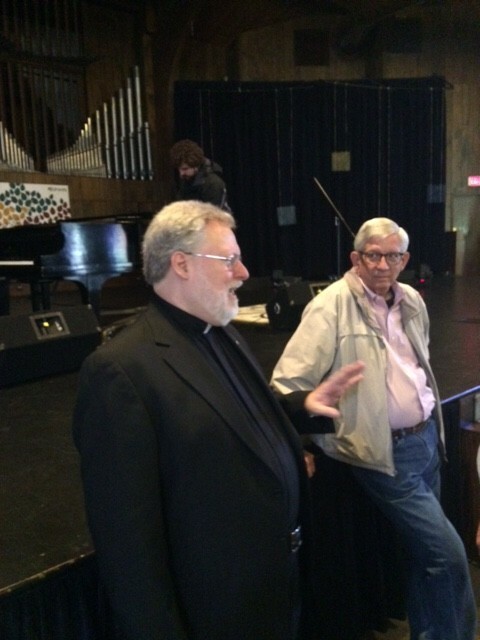 On Wednesday, October 8, I introduced Fr. Thomas Baima to the Judson University community. I do not know if Judson has ever had a Roman Catholic priest speak as a primary preacher in their chapel but on this gorgeous fall day it happened. The anticipation and prayer was palpable to me. A lot had gone into this service behind the scenes, including dialogue over many months, a meal that we all shared together, and much planning about details and liturgy. Music was provided by my friend Aaron Niequist as well. Aaron is a fellow-traveler and shared in the Lausanne Catholic-Evangelical Conversation in September. This particular chapel began on a very sad note. A great trial touching the entire Judson family was shared with the students at the beginning. But we proceeded by asking God to meet with us in our prayers and worship. Fr. Baima ended by offering a rich and pastoral response on behalf of the Judson community through his closing prayer. Many have said to me, for an entire lifetime, “I have never heard a Catholic priest preach the gospel, and show what evangelism is and what it means to the life of the church.” Well, this happened at Judson. Fr. Baima opened up Matthew 28:16-20 and reflected on the text as a Catholic who is faithful to his own ecclesial standing. This is an excellent sermon. I hope you will listen to this second message from Christian Unity Week at Judson. I cannot answer if he spoke there but he was Catholic but not an active priest in later life. It was not, as you note, part of a Christian Unity dialogue.